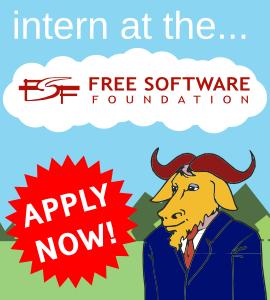 As an intern, you work closely with FSF staff members in your area of interest, such as campaign and community organizing, free software licensing, systems and network administration, GNU Project support, or Web development. interested in the ethical ramifications of computing. We strongly prefer applicants able to work in-person at the FSF headquarters in downtown Boston, but applicants based elsewhere may also be considered. Unfortunately, due to the complexities of US immigration law, applicants who are not US citizens or permanent residents and do not have a visa allowing them to work in the US must work remotely from outside the US. The campaigns team is particularly interested in interns interested in working on the End Software Patents campaign or the International Day Against DRM. The End Software Patents campaign works to end the patentability of ideas in software. While other advocacy groups focus on bad or stupid patents, and on patent trolls, we emphasize that these are only symptoms of a fundamentally broken system. *No* software ideas should be patentable. Each position lasts for one twelve-week term. There are three terms: summer, fall, and spring. There can be some flexibility with start and end dates if necessary. Any of the terms can be worked as either full time (forty hours per week) or part-time (twenty hours per week) positions. We will prefer candidates able to work full time, particularly during the summer term. From time to time, remote internships are possible, but we prefer in-person internships. Send a letter of interest and resume with two references by email to hiring@fsf.org. Make sure that your materials are in free software friendly formats (PDF and plain text work well), and include "Internship" in your subject line. If you can, please include links to sites you've made (personal blogs are okay!) designs or code you've done, and relevant writing. Please include these as URLs, though email attachments in free formats are acceptable, too. Please direct any questions about the program to hiring@fsf.org.